Many of you know I placed second in the Sandy Writers’ Contest two years ago. (That’s me in the photo, I’m the one in the middle with the red shirt.) 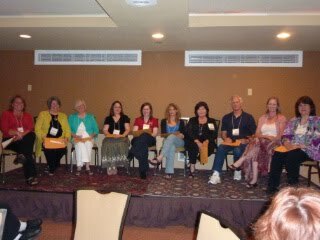 I also had a fabulous learning experience at the Crested Butte Writers Conference, which sponsors the contest. I wanted to let you know, I received word from the contest administrator that 1. There are only six more days for you to enter this year and 2. There are few entries in almost every category! This contest is so worth your while. It doesn’t cost much for the opportunity to have professional and semi-professional judges critique your material. Of course, if you get to the final round, you will have an agent or editor read it and, if you go to the conference, you can pitch to that agent or editor. This talk wasn’t just about characterization, but how proper characterization can become indistinguishable from plot. Janet suggests plotting stories using Inner and Outer story questions, advice most of us should be familiar with by now, but we’ll go over it using the plot from Avatar because everyone’s seen it by now. Right? The Outer story question is a specific, tangible action-oriented goal and the character must strive for (or against) it. In Avatar, the Outer Story question is: Will greed destroy Pandora? The Inner Story Question must be stated as a question, involves the character’s need, each character has his or her own inner question that is resolved in yes/no fashion by the story’s end with a resolution that is satisfying to the protagonist. The inner story question DRIVES the Outer Story. Avatar’s Inner Story question: Will Jake sell his soul and betray Neytiri and the Navi to walk again? Now, how free are your characters? What are their turning points? It’s only a turning point if someone acts. Most turning points are at the beginning of Act I and 2. (Sometimes there’s one in the middle to act as a buttress to your story arc.) Who drives the characters’ decisions? In Avatar, the first Turning Point for Jake is when he abandons the scientists and the NAVI and joins the Colonel and the “Greed” team. He is motivated by his desire to walk again. The second Turning Point is when he defies the Colonel and the team and fights for the NAVI. He is motivated for a variety of reasons including love, revenge for the Colonel’s lies and the death of the NAVI, their spiritual center and the death of Sigourney Weaver’s character. What are your story’s Turning Points and what are the character’s motivations for turning? In other words, who is driving the story? Are external events doing it, or are the changes brought about by your character’s decisions and motivations? Who is in charge of your character arc? Another way of looking at motivations, is to examine what the character wants, why he/she wants it and why they can’t get it, their worst fear (which should probably revolve around the inciting incident) and how they accept the call to action. See how this works for Jake: He wants to be accepted, believes “he’s just another dumb drunk”, he cannot get what he wants because he hasn’t yet claimed his life, his worst fear is that his naysayers are right and that he’ll never be more than a broken ex-marine, but then his twin brother dies, giving him an opportunity to fit in again. He accepts the opportunity and travels to Pandora. Do you see how most of that happens off screen?